We love the HP Lovecraft Literary Podcast so much we sponsored them twice! We are kicking off November with yet another excellent Robert E. Howard Conan tale – it’s The Slithering Shadow! Don’t waste time! 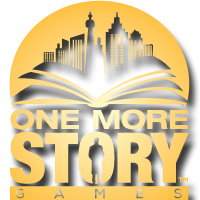 Check out this week’s sponsor, One More Story Games! It’s a great platform for both writers and gamers, and currently featuring cash prizes in the Write a Story Game 2015 contest. Get involved now!